Not just as in a place to escape the heat--but "cool" as in, you want to hang out here all day. Montage offers not just a clean aesthetic (with stools covered in beautiful Japanese imported textiles) but delicious coffee by West Roast. Located in the Red House Arts Center complex, just across the street from the SU Warehouse on Fayette and West Street, I suddenly have a place to get my coffee on as I walk to campus. Need more reasons to check it out? Can you say--baked goods by The Sweet Praxis and a commitment to sourcing local ingredients? All brought to you by Christian VanLuven and Tomomi Yoshida--the couple behind Roji Tea Lounge. Deb and Dave Whiting of Red Newt Cellars and Bistro helped change the view of the Finger Lakes as a place for wine only. Thanks to their pioneering efforts our wine region became a place where you might go just for the food. The death of Deb Whiting in yesterday's car accident is a great loss. And I don't just mean locally--Deb was known, loved, and admired far and wide. I didn't know her well--but whenever I saw her at the Bistro or at dinners like last fall's harvest dinner at Creekside Meadows Farm in Tully--I found her to be as engaging, genuine, and fun as could be. She worked hard and she leaves behind, all too soon, an incredible legacy. Of course, Deb was also many other things and in these days I bid your prayers, good vibes and wishes for her beloved husband and partner Dave. Recent reports say he is in stable condition and I hope his recovery is speedy. But my heart aches for him in his personal loss. Lately I've been walking and biking around Syracuse exclaiming--"What a great place to live!" While it can be too easy to be the jaded and cynical Central New Yorker who complains laments that there is nothing new under the sun here there is a lot that is quite exciting. So here's a little 'Cuse love (and no, I'm not collecting a paycheck from the Convention and Visitor's Bureau). 1. In the last few months 12 restaurants have opened up in downtown Syracuse. Not across the city--just in downtown alone! I ducked into a couple of them today and can't wait to get back for a proper meal. I'll post first impressions as I do. These tiny, and not so tiny, eateries span the gamut from diner to Lebanese to real Brooklyn-style Pizza (with 1970s era pinball machine to match). Darwin on Clinton is an off-shoot of Riley's (the neighborhood restaurant every neighborhood wants to have). David and Daryl have put together an extensive sandwich menu that will change often. They're open from 9am -2:30 pm Mon-Fri--and later on Fridays when do their Fish Fry Frydays). I'm looking at those cafe tables on a nice day like today and thinking "this is THE spot!" It is easy to forget how large an area the Mediterranean really is. For Byblos, it is centered on Lebanon so their menu not includes baklava and spanakopita but Labneh, a delicious Lebanese cheese dip made from yogurt. They also brew up Turkish coffee. 2. The Downtown Farmer's Market is now at Clinton Square. On a day like today, with bright sun and a nice breeze, Clinton Square seems like the best place to be for Tuesday market shopping. Actually, the market was a Clinton Square a couple of decades ago so this is a bit of a homecoming. Today I picked up some early season, local, strawberries and was delighted to discover that Second Story Cafe will be at the market this year. They are serving up delicious iced Gimme! coffee (and selling bags of Gimme's latest roasts), cookies, fresh, cool, salads, and Ciao Bella gelato sandwiches (ice cream sandwiches for grown-ups). 3. Cycling. I went out with a friend yesterday and biked from downtown, to the Westcott Nation to the Jamesville quarry and then back home to downtown and it was glorious! That I could be out in what at times felt like the middle of nowhere with incredible views of hills and valleys and then down in the Monday morning rush hour of commuting traffic downtown in the space of 30 minutes just stuns me. 4. There are places where people know your name. I walked into Sakana-Ya (downtown) for lunch yesterday and was greeted like a long-lost friend by Yurah--it was like coming home. She said it had been a long time since I'd been in and she was right--a month is WAY too long to go without their delicious sushi--never again! And the new Korean fusion place next door, Namu, is owned by the same family. 5. As a rule, I'm picky about my sausages and hot dogs. But there was one at the Taste of Syracuse that I absolutely had to try--it was Lieh's and Steigerwald's chicken wing sausage. Because you know, one has to wonder how they get the wing in there. But OMG--what this is is the best of a buffalo wing with the blue cheese dipping sauce folded right in. It sounds crazy and it totally works. You all have probably been eating these for years so I'm a little late. I must get a pack of them right away! 6. The Saturday CNY Regional Market. I know--I haven't always shown the love for this market but though it can still be tricky to navigate, there is a lot of wonderful stuff there. Like Keeley's farmstead cheese. I let a slice of this Brida melt on top of a burger that rested on a toasted English muffin slathered with caramelized onion fig jam--incredible! 7. This is a community that rallies when help is needed. I recently received a Facebook message that the grant program that puts fresh food into one of our local public schools was being threatened because the school didn't meet the new criteria for poverty. What? Farmer and school teacher Megan Luton is trying to do something about it. Become a friend of Stones Throw Farm on Facebook and find out how you can help. 8. Stretch Bread. There's nothing like it. And it's ours. 9. Onondaga Lake. Yes it still has a long way to go to get cleaned up but how lucky are we to have such a beautiful body of water in the midst of our city? I've been spending Saturday mornings cycling around the lake and have even gotten out there on a Sunday at 7am to "Listen to the Lake" as a form of meditation and healing for this precious resource. As I watch what is going on with the gulf oil spill, I'm especially thankful to those who have been working tirelessly to correct the environmental wrongs we have done to Lake Onondaga. And if you watch and listen carefully you'll see there is reason to be hopeful. 10. The Syracuse Real Food Co-op is really moving! Have you seen the preliminary store drawings? I know they'll change but my it is exciting. Go Co-op! 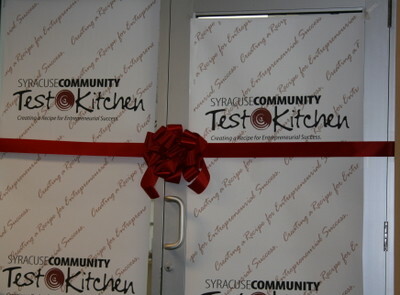 Today's opening of the Syracuse Community Test Kitchen. Ray Cross, the president of Morrisville State College says, "We want to put a product on store shelves where a neighbor could say 'I know the person who made that' made with ingredients grown in their neighborhood" He's my new hero. A review of some fabulous lunches I've had at Sparkytown in Hawley-Green. Freshly roasted beans at Cafe Kubal in Eastwood. Browsing the cookbook and food literature section at Books End in Eastwood. The launch of Edible Finger Lakes--the first issue debuts next month. Archive Alert: On this date in 2006 I was catching up on the organic news of the day. But barbecue tastes better the next day than the bitterness of defeat. Sampling the sampler — a tactic I’ve employed everywhere one was offered — didn’t always pay off, as when I visited Dinosaur Bar-B-Que, a popular place tucked under a stretch of the West Side Highway in Harlem. Dinosaur is definitely the barbecue place to take the kids to: a waitress was infinitely patient when I visited with a friend, his wife and their two rambunctious youngsters. As for the eating, there’s no question that the pork spareribs at Dinosaur are significantly better than everything else (and certainly good enough to warrant a visit). Order them by the rack and skip the menu’s other distractions. I know The Dinosaur has had its troubles recently, but still, there is no better Cue in the 'Cuse and I think we'd stand up against the competition but the tasters may have to come up here to get the real thing. We had some folks up from New York City last weekend and catered in Dinosaur Barb-B-Que--they went crazy they loved it so much. The next time I get to Harlem I'm going to do some tasting to make sure they're not messing up our good name. If anyone has been to any of the other Dinosaurs, post a comment and tell us how it was. Meanwhile, I've hobbled my way to Memphis for a meeting. I didn't read my notes till I was on the plane but we were supposed to bring jeans for Thursday's dinner--is that a clue that we'll be having BBQ? I'll let you know. Now here's a combo I can get down with--waffles and free, live, funk music. Eating waffles is a decadence that I indulge in only occasioally these days. When my husband and I are lucky enough to have a leisurely Saturday morning to enjoy breakfast together I'll often whip up a batch of waffles topped with maple syrup and served with a side of bacon. Yum! But here comes La Tazza with a whole new spin on the concept--literally. They'll have live music with the Flavour and Theme Trio beginning at 9:00 pm (no cover). And if the music doesn't make you want to dance, the menu will--they will be serving up sweet waffles like classic buttermilk, Belgian style, and even a vegan variety. Savory options include waffles piled with Dinosaur Bar-B-Que pulled pork and waffles stuffed with goodies liked smoked gouda and herbs. Egg sandwiches and paninis round out the menu. And, according to Marty at the Co-op, they are looking to organic and local sources for many of their ingredients--can you dig it? Funk 'n Waffles has its grand opening tomorrow. They are still working on their website but keep checking here--they should have more info up soon. They are located in the La Tazza cafe which is located off of South Crouse in the Campus Plaza--downstairs--behind the Marshall Square Mall. Now tomorrow, I'm beginning a three-day juice cleanse and won't be able to get there but I'd love to hear a report. Give them a try and let me know what you think. Lest you think I've fallen off the face of the earth, let me assure that all has been well, just busy. This Christmas has had me writing and preaching every few days--often every day--leaving me little more energy to blog. But the New Year is approaching and I'm ready to resume my regular blogging rhythm. So thanks for hanging me with through my little recess. Speaking of Recess...you may have also noticed that the upstart cafe and skateboard shop with the obsessively and delicously fresh roasted coffee beans over near Westcott Street has been closed. Word is, their recess is almost over too. Adam Williams, a former staffer at the Syracuse Real Food Co-op, has purchased Recess from Sean Chilson and plans to re-open next week--around Thursday. Adam is no slouch in the food knowledge department so we can expect that Recess should thrive under his leadership. So this is a Nebraska Wedding! Until this past May, I'd never heard of a Nebraska Wedding. Weddings in Nebraska, yes. But an edible Nebraska Wedding??? Let's just say that I've got some work do to on the heirloom tomato learning curve. It happened like this. At the end of one of the Board meetings of the Syracuse Real Food Co-op, Jennifer B started handing out tomato seedlngs to any one interested. I had already gotten a late start on mine and had a few transplants but I thought, one more couldn't hurt. She handed me one of the healthiest little tomato plants I'd seen--nice and green with healthy strong stems. She has a great gro-light thing going. Anyway, I added the Nebraska Wedding to the fold and waited. When it came time to harden off the tomatoes I began placing them outsisde near where they would be planted--just next to the driveway. One morning in June I kissed my husband goodbye as he left for work and then watched him back out of the driveway--right on to the tomatoes. You could hear my screams from the the other side of town, I'm sure. I yelled "Stop!, Stop!" But he didn't hear me and it was too late. Practically the entire crop was mowed down. But on the advice of a fellow gardener I planted them anyway. Well, they all did just fine. In fact, this is my best crop of tomatoes ever. And after months of waitng the Nebraska Weddings are finally ripe for the picking--and are they ever worth the wait! These are large orange globes of tender sweetness. I had one as a side dish for dinner the other night--I just sliced it still warm from the sun and sprinkled some grey salt over it. This is truly what summer is all about. 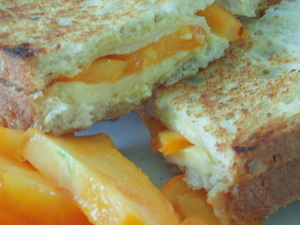 Today, I sliced one up and made a grilled cheese sandwich made with some Grafton Village maple cheddar cheese on Pheasant Bread--delicious! 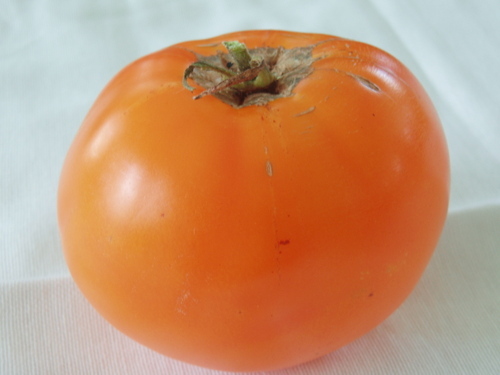 If you think heirloom tomatoes are the prize of summer or want the opportunity to taste a variety of them prepared by one of Syracuse's best chefs, you gotta check out the BC Restaurant Heirloom Tomato Dinner. There are seatings at 6:30 both tonight and tomorrow. Tonight might be full but word has it that there is still room for tomorrow's dinner. At $35 for a multi-course meal, I think its a steal. This is tomato season so whether you can get to the dinner, grow you own, or get to the farmer's market--do whatever, but get 'em while you can! The only thing better for Valentines Day than a story about new love is a story about a reunion. This reunion is only a week old but lucky Central New York--we all get to benefit. If you've been looking for Brian Shore--the chef-owner of Kettle Lakes in Tully, you need look no further. He's come back to the Arad Evans Inn in Fayetteville. According to Arad Evans Inn owner, Jason Thomas, this is a happy ending for all concerned. 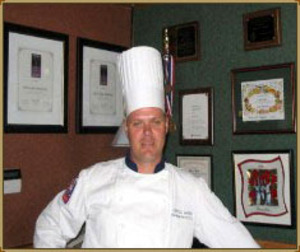 Brian Shore was the chef at Arad Evans for three years when he decided to venture out on his own. He opened Kettle Lakes 6 1/2 years ago and was known for his serious commitment to fine dining sourcing from local and sustainable purveyors. As anyone who has been to Kettle Lakes knows, unless you live in Tully or Preble, it was a bit of a hike to get to. But oh so worth it. The Central New York restaurant scene isn't quite like San Francisco or New York City so you won't find any drama about chef-stealing here. While the food at Kettle Lakes was great it did require an investment that many diners didn't have for the weeknight dinner service. Shore was already looking at his options when the conversation with Arad Evans began to heat up. For the time being Shore will carry the title of head chef but the possibility for co-ownership may lie ahead. With Brian Shore on board, Thomas believes that Arad Evans is poised to become the best restaurant in Central New York. With their location and wine collection and reputation for great service they certainly have that potential. Plus, Shore will bring all of his local purveyors to the table making it just that much easier for those in the Syracuse area to eat out and eat local. By Thomas' own admission the Arad Evans Inn website needs some work. But if you want to get a sense of what's to come check out the Kettle Lakes website while it is still up. Better still, check out the NEW Arad Evans Inn. Photo courtesy of Kettle Lakes website.